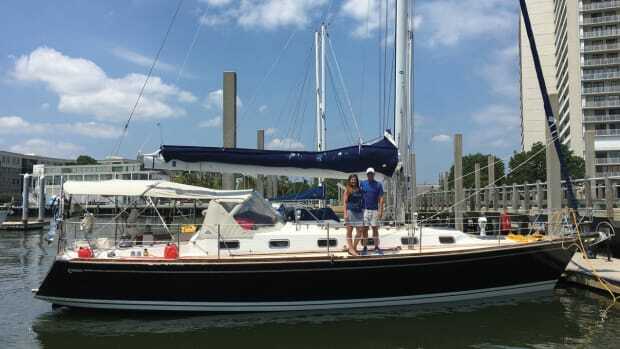 When the sun beats down and sail shadows narrow to lines on a hot deck, a sailor’s thoughts inevitably turn to shade. The ability to shelter from the sun can make the difference between a miserable day on the water or a glorious one. 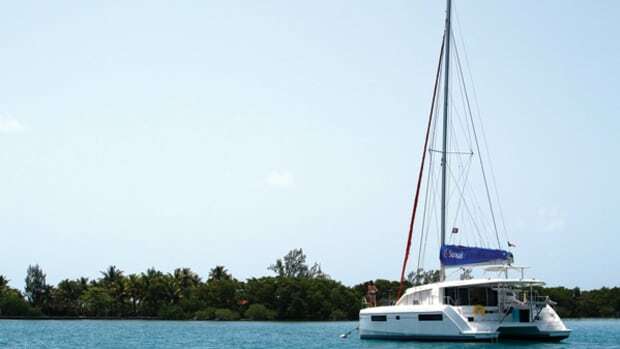 Sun shelters on a sailboat can be separated into two types—harbor awnings and sailing awnings.  Harbor awnings are easier to fabricate, so let’s start there. A typical harbor awning is simply a fabric tarp with grommets in the corners and in the centers of the forward and aft sides. Whether rigged flat or tented, it is fabricated flat, making it a perfect do-it-yourself project. The ideal harbor awning is rigged drum tight and presents only an edge to the wind so it can be left up even in squally weather. That means you shouldn’t make it too big, nor should you incorporate side or back curtains. Side curtains, in particular, often go unused because they also block the breeze. It is much better to design and fit curtains later after you’ve settled on the best way to rig your core awning. For the core awning, all you really need is a length and two width dimensions, one forward and one aft. These are best determined by rigging heavy cord where you expect the sides and the ridge of the awning to be. Start with a horizontal cord at the planned location of the ridge (Fig. 1). On a boat with two masts, this cord will typically stretch between the spars. 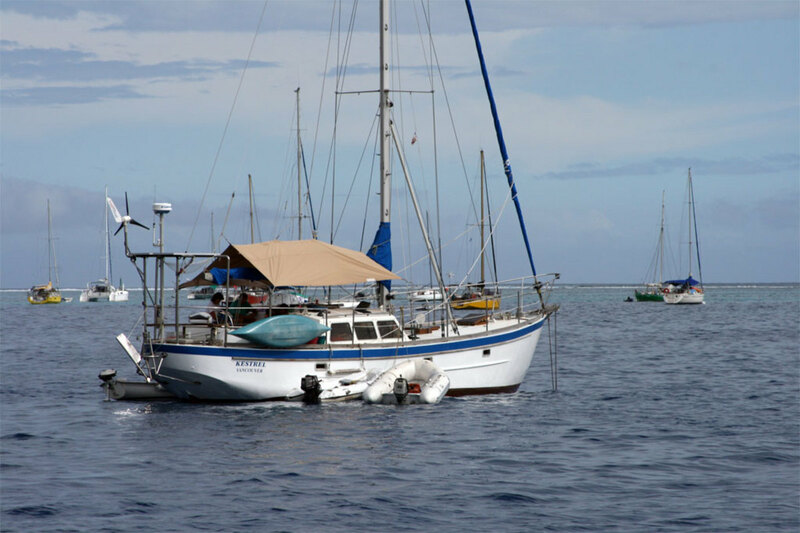 On sloops and cutters, the awning is usually suspended between the mast and the backstay. With the horizontal ridge cord rigged tight, tie a second cord athwartships between the planned fastening locations for the forward corners of the awning, looping this cord over the ridge cord. 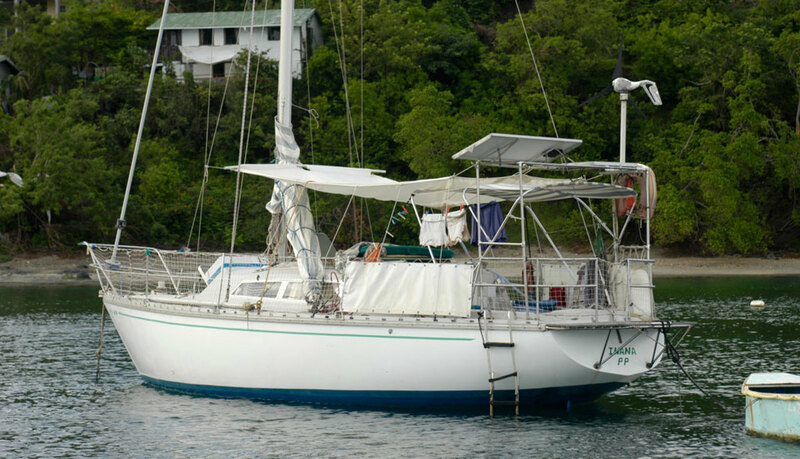 On our ketch, we tie the corners of the awning to the main aft lower shrouds and the mizzen forward lowers, but lifeline attachments are also common. Use a second cord to position the aft edge of the awning. Awnings with spreaders are harder to stow. They are also more troublesome in high winds and more difficult to douse. Nonetheless, on some boats, spreaders are necessary in order to get adequate height or an adequate spread, particularly aft. If your awning is to have spreaders, tie these in place as you’re laying out the awning perimeter with a cord. They can either slot into pockets in the awning or be rigged externally (Fig 2). Wooden dowels, PVC water pipes and aluminum tubing are all commonly used for spreaders, but be aware that plastic pipe is sometimes too flexible. Once you have the four sides of your awning defined with cord, check to see if there is anything penetrating the defined box—a topping lift, for example. If so, you will either have to reduce the size of the awning or incorporate a hole or closing slot so the awning can fit around the obstruction. Sketch the defined box on a sheet of paper and write in the dimensions, keeping in mind that this will not be the actual size of the awning. You need to allow a few inches for the fabric to stretch, for the rigging to deflect, and to provide some space between the fabric and the tie locations so you can pull the awning tight with your rigging lines. Ideally, you want the rigging lines to pull equally to the side and forward or aft, so reduce both the length and width dimensions by not less than 6 inches, a bit more on a big awning. You can then strike out the measured dimensions and write these new smaller numbers on your sketch, or you can give the awning a 1-1/2in double-rubbed hem all around, which requires no calculations. “Double-rubbed” simply means you fold the fabric edge over twice to hide the raw edge inside the second fold. If both folds are 1-1/2in, this moves each edge in by 3 inches, reducing the total width and length by 6 inches and requiring no modification of your raw dimensions. Don’t construct your awning from a poly tarp. The rustling noise it makes will drive you and your neighbors to distraction. Don’t use an old sail or new sailcloth either, especially nylon spinnaker material. 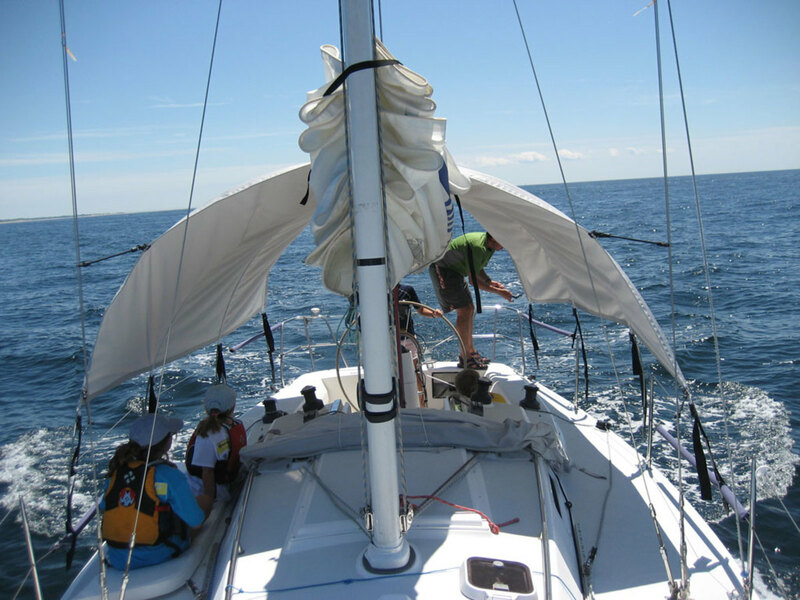 Sailcloth does not block out harmful ultraviolet rays, and nylon is both noisy and transparent. For occasional use, the best fabric for a sun awning is treated cotton duck, called marine-treated preshrunk canvas, and sold under the brand names of Permasol, Vivatex and Sunforger. 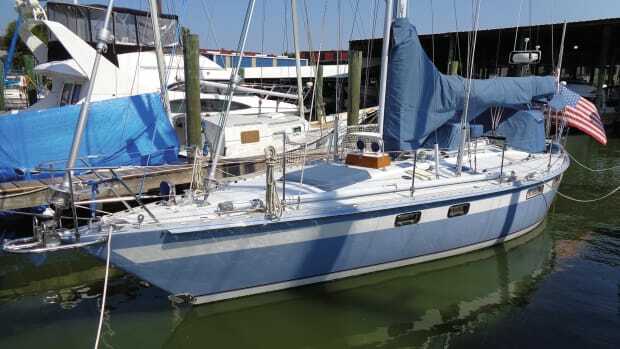 Treated canvas is susceptible to UV damage and has a shorter life expectancy than a synthetic when rigged for months at a time, but for weekends and vacation cruises, it will serve for decades, as long as it is stowed dry. An awning made from treated canvas will be tough, quiet, abrasion-resistant, impervious to UV rays, waterproof, and cooler because of the color and because the fabric breathes. It also costs at least $5 per yard less than synthetic canvas. 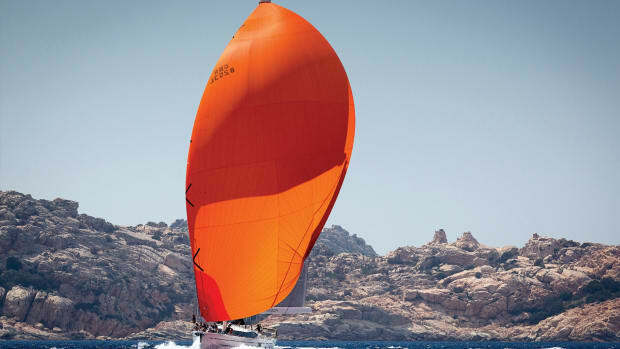 Still, most sailors choose acrylic canvas—Sunbrella and similar fabrics—both for the color choices and because such fabric requires almost no care other than avoiding chafe. Woven polyester—Top Gun and similar—also makes a good awning material, but lacks the vibrancy and durability of acrylic canvas. For a lightweight awning, a light woven polyester fabric such as Odyssey III can be another good choice, although it doesn’t provide the UV protection of natural or acrylic canvas. 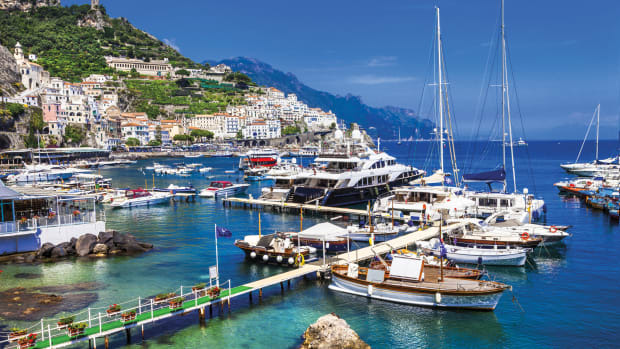 In general, lighter-colored fabrics make better harbor awnings. Darker colors tend to provide deeper shade, but dark fabrics also get hot and radiate rather than reflect the sun’s heat. An awning that sets high above the deck can be a dark color without significant consequence, but if your head will be close to the fabric, you will regret choosing a dark awning. 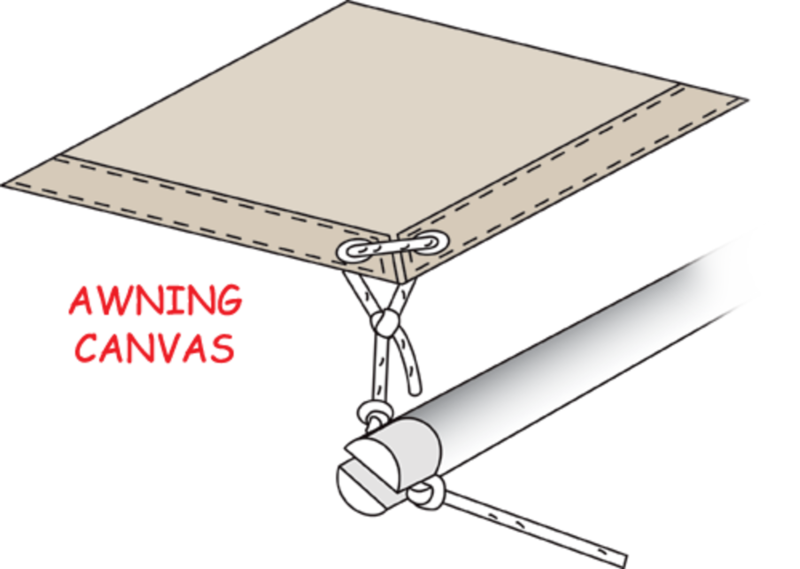 Treated canvas is typically sold in 36in or 42in widths, while acrylic canvas comes in 46in and 60in widths. Unless the awning is narrow enough to construct from two panels with the center seam at the ridge, the seams should run across its width. Because the fabric has finished edges (called selvages), the simplest and best way to join two panels is to simply overlap their edges about an inch and sew them together, exactly the way the panels on your sails are assembled. If your machine has a zigzag stitch, use it here, overstitching the fabric edges to prevent them from curling. When buying the fabric you’ll need to take into account that each seam overlap reduces the width of the joined panels by an inch. The wide hem all around reduces the need for additional reinforcement, but if you want to add reinforcement patches at the grommet locations and your dimensions will not leave you with scrap material, add a little extra to your order. You will also need extra fabric if your awning will have spreader pockets. Fold and crease the hems as normal. One half inch outside of the intersection of the innermost creases, cut off the corner of the fabric at a 45-degree angle. Put a 1/4-inch double rubbed hem on the diagonal edge. Now fold and sew the two hems as normal, stitching their ends down where they abut diagonally. Install grommets on either side of this juncture. Start assembling your awning by sewing the panels together with three rows of stitching—a zigzag stitch is best—and then trim the assembled panel to your raw dimensions. The awning will be quieter if you cut the fore-and-aft sides with a slight hollow—about an inch for every 6 feet of side length. Fold the hems accurately and crease them by dragging the edge of a stiff putty knife over the fold, applying plenty of pressure. 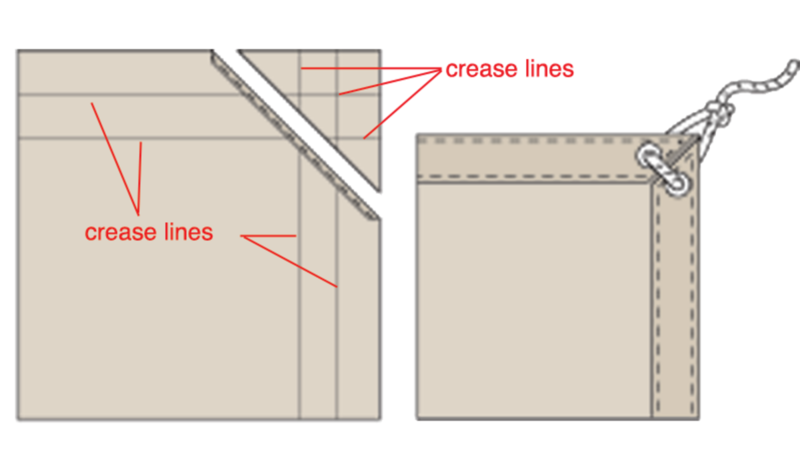 Almost any sewing machine will sew through the three folds of canvas in a double-rubbed hem, and most can be helped across the extra thickness at the panel seams. The nine layers at the corners will, however, challenge a home machine. The solution to this is the mitered corner, illustrated in the sidebar. Once the awning is hemmed all around, all that remains is to install grommets in the corners and at the center of the forward and aft edges. Spur grommets are best. For a normal awning, select the #1 size. If you use washer grommets (much less secure), the size you need is #2. To compensate for the weakness of a mitered corner, install dual grommets, one on either side of the diagonal seam, and then run your rigging line through both. Take the finished awning to the boat and use a light line to rig it. You will have to experiment with height and corner tie configurations. External spreaders can be rigged by slotting them over the tie-down lines, with knots above and below to fix the spreader in position. Carry grommets and an installation tool with you, as you may find additional tie locations are required to get the awning to set the way you want. A harbor awning that sees continuous use should incorporate some additional features. The most important are a rope at the ridge to carry the strain and reinforcement patches at the tie-down points. Such an awning might also have a center lift to increase headroom, integral or attachable curtains to exclude low sunlight, and hose fittings to allow the awning to double as a rain catchment. However, if your awning will be deployed and stowed regularly, keeping it as simple as possible and as small as practical will assure that it goes up when the anchor goes down. 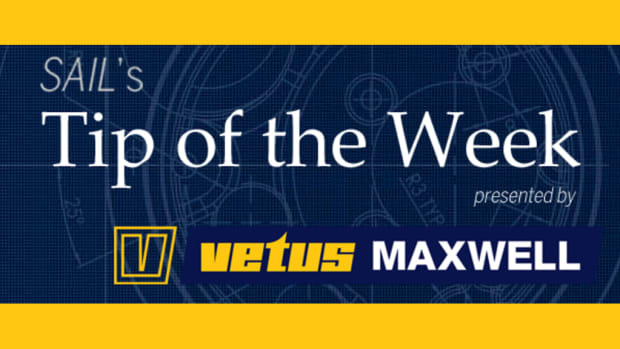 If you don’t have the time to make your own awning, there are other options. 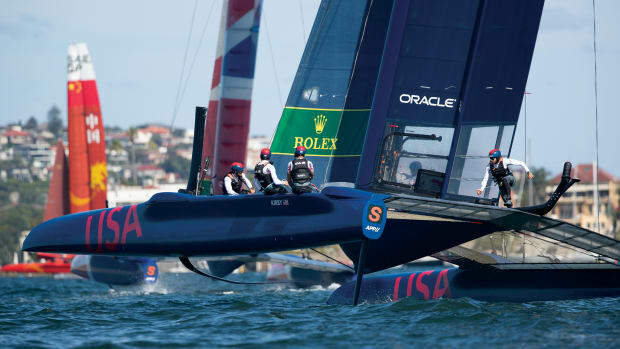 If you want a tailor-made awning, most sailmakers will be happy to oblige. Some mail-order chandlers stock ready-made awnings in a variety of sizes. You are sure to find one that will fit your boat, albeit not as well as one that has been measured and made specifically for it. Some shade solutions are more complex than others. Blue Performance has a range of ripstop nylon awnings that vary from basic over-the-boom rectangles to complex dome-tent-like arrangements with multiple spreaders. Ripstop nylon awnings are better suited to occasional rather than regular use, but are light and stow more compactly than similar-sized awnings made from canvas or acrylic. Nylon used for awnings should have a UV-resistant coating.